Our community is a part of downtown Cotati, California (population 6,700). We are a typical cohousing community in that we are not organized around any particular religious, economic, political, or lifestyle focus, other than our intention to create a neighborhood that by its physical design and social structure facilitates community. Our community houses 30 families (including singles, couples with and without children, and single parents) in townhouse-style attached homes. Our common house includes a kitchen, dining room, guest rooms, children's room, and a workshop. 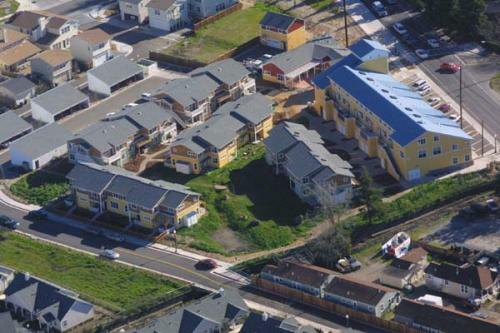 We're a little different from many cohousing communities in that we were required by the city of Cotati to include 6700 square feet of retail space as part of our development. We decided to keep ownership of this retail space as a community. We now live next door to a handful of small businesses, which are locally owned. Community dinners and workdays are a part of our lives. Our key policy decisions are made by consensus, and we meet once monthly for two-hour business and community-development meetings. Our group formed out of the old Acacia Cohousing Group in Santa Rosa, California, a group which started meeting in November of 1994. The current group came together in the late summer/early fall of 1998, and in January 2000 we found a 2.3 acre parcel of land in downtown Cotati. With the help of the Cohousing Company (Nevada City, California), and our developer, Wonderland Hill (Boulder, Colorado), construction was completed and residents began moving into their new homes in 2003.